India is at the center stage of growth and development. As one of the world’s fastest growing economies, India’s energy needs have risen steeply. Coal is the most important indigenous energy resource. It remains the dominant fuel for power generation and finds use in many industrial applications including steel and cement. Even though India is one of the top producers of coal in the world, it still imports coal to meet growing domestic consumption. India has a strong focus on reducing its reliance on energy imports and is making significant investments to boost energy infrastructure. The excavation and processing of coal is executed by mining companies hired by Coal India Limited (CIL), the state owned coal mining corporate, and its subsidiaries. Sushee Infra & Mining Limited is one of the key organizations engaged in overburden removal across mining sites in India. Through consistent performance improvement, Sushee Infra has earned for itself the reputation of bagging repeat government orders. However, with growth have come a few challenges. Sushee Infra is under immense pressure to enhance the pace of overburden removal and simultaneously bring down the costs. Sushee Infra joined hands with its long-standing partner Tata Hitachi by providing state-of-the-art construction equipment for overburden removal at the coal mines of Sathupalli. Tata Hitachi is a prominent player in the construction equipment industry in India. Tata Hitachi’s vision of empowering people and the communities reverberates with Sushee Infra’s vision of nation building and making India self-reliant. In order to ensure lower cost of production and faster execution, Tata Hitachi has provided Sushee Infra its latest range of hydraulic excavators, the ZAXIS470H GI series. In a short span of time, the GI series has become a preferred choice of miners across continents. These hydraulic excavators are powerful, deliver high production with impressive fuel economy, offer swift front movements, are easy to operate and durable as well. All these factors contribute to the low running costs of ZAXIS GI series hydraulic excavators. ECO Mode. ECO mode ensures significant reduction in fuel consumption over conventional hydraulic excavators without sacrificing digging force. Swift Front Movements. The HIOS IIIB (Human Intelligence Operating System) hydraulic system provides maximum operating speed while keeping the fuel economy intact. Enhanced Swing Torque. The all-new swing device ensures improved swing power over conventional models. Multifunction Monitor. High-resolution multifunction controller allows operator to check operating variables like oil temperature, fuel level, work mode and maintenance support, among others. Low Life Cycle Costs. Long service intervals ensure low maintenance costs. ZAXIS470H GI series hydraulic excavators are delivering exceptional results under varying soil conditions at the coal mines of Sathupalli. This case study will further divulge details about the major challenges encountered by Sushee Infra at the coal mines of Sathupalli and how the company harnessed immense capabilities of ZAXIS470H to meet stiff cost and project timelines and simultaneously retained profitability. With the growth in the coal industry, competition in the form of new mining companies has started pouring in from all directions. This is accompanied by ever-mounting pressure to increase production, while significantly bringing down the cost incurred. All these factors have led to a situation where a mining company is pressed hard to find new technologies and excavation techniques, which are not just cost-effective but also strengthen the bottom line. Sushee Infra & Mining Limited, better known as Sushee Infra, one of the leaders in the mining industry, also encountered similar challenges at the coal mines of Sathupalli. Sushee Infra leveraged its industry expertise to evaluate the key factors, which, if addressed, would help achieve the targets while remaining profitable. Every coal-mining project relies heavily on construction machinery for overburden removal, especially the hydraulic excavators provided by the Original Equipment Manufacturer (OEM). At the coal mines, the hydraulic excavators work in a 24X7 environment under gruelling conditions. These machines can prove to be the determining factor for the success of a project. Cost reduction. Controlling costs is one of the key challenges faced by miners everywhere. Only a fuel-efficient hydraulic excavator could help Sushee Infra keep the costs under check by ensuring maximum production in less fuel. Maximum machine availability. Overburden removal is a cost and time sensitive operation. Any unwarranted breakdown results in significant losses. Sushee Infra sought to reach a fail-safe arrangement with OEM to gain protection against machine breakdowns to ensure maximum machine availability. Simplified maintenance. Sushee Infra was looking for a hydraulic excavator which could ensure low maintenance and easy serviceability. This would ensure that the excavator is affordable, efficient and highly productive throughout its lifecycle. High performance and durability. Coal mines have varying soil conditions. Sushee Infra needed a robust excavator with rock-solid construction, which could deliver optimum performance in all conditions. With challenges laid out, it was time for Tata Hitachi to come up with a well-crafted solution that would precisely meet the requirements. Tata Hitachi is at the forefront of construction equipment industry in India. Over the years, Tata Hitachi has expanded and created a robust, diversified product portfolio, which boasts of state-of-the-art technology, unmatched quality and strong adherence to compliances. Sushee Infra, a high-valued customer of Tata Hitachi, required hydraulic excavators, which would be highly efficient, perform in varying soil conditions, require least maintenance and showcase unmatched durability. Tata Hitachi’s latest in the line of hydraulic excavators – the ZAXIS470H GI series – matched all these requirements. A fleet of ZAXIS470H hydraulic excavators was therefore deployed at the coal mines of Sathupalli for overburden removal. Here is how the GI series has helped Sushee Infra overcome the cost and time challenges and still remain profitable. ZAXIS470H GI series hydraulic excavators are powered by a 315 HP engine. This powerful engine makes the machine capable of achieving higher production in tight job schedules. Moreover, this engine has a proven track record of showing impressive durability at countless mining sites around the world. HIOS-III (Human Intelligence Operating System) is the latest hydraulic technology offering from Hitachi across the globe. The improved hydraulic control system not just ensures swifter front operations, but when coupled with the fuel-thrifty diesel engine, it helps deliver significant fuel savings as well. Fuel economy is further enhanced by the two operating modes viz., PWR (Power) and Eco modes provided in the ZAXIS470H. PWR and ECO modes ensure high production at low fuel consumption. When operated in ECO mode, the excavator reduces the fuel consumption further without compromising the digging force of the excavator. ZAXIS470H features a heavy duty undercarriage for demanding Indian conditions, a larger pin diameter and reinforcements on front attachments, the arm and boom. All these features result in enhanced durability and make ZAXIS470H one of the most durable hydraulic excavators in its class. GI series hydraulic excavators are a fine example of meticulous engineering. The inspection points are concentrated on the wall around the engine. A walkway has been provided in center of the upper structure for easy access to the engine and inspection points. This ensures easy maintenance of the engine oil filter, pilot filter, drain filter and water separator. Moreover, the service intervals are long enough to keep the maintenance costs low. The operator’s cabin on ZAXIS GI Series has been designed with special focus on operator’s comfort, safety and ergonomics. The FOPS (Falling Objects Protection System) cabin is robust and complies to ISO 3449 Level-I and Level-II. Tata Hitachi has provided a Full Maintenance Contract (FMC) to Sushee Infra. It goes beyond 25000 Hrs of machine operation. The FMC ensures high availability of machines which is very important to attain the production timelines. As part of FMC, Tata Hitachi maintains a dedicated spare parts warehouse on site and also provides experts including engineers and technicians to take good care in case a machine breaks down. 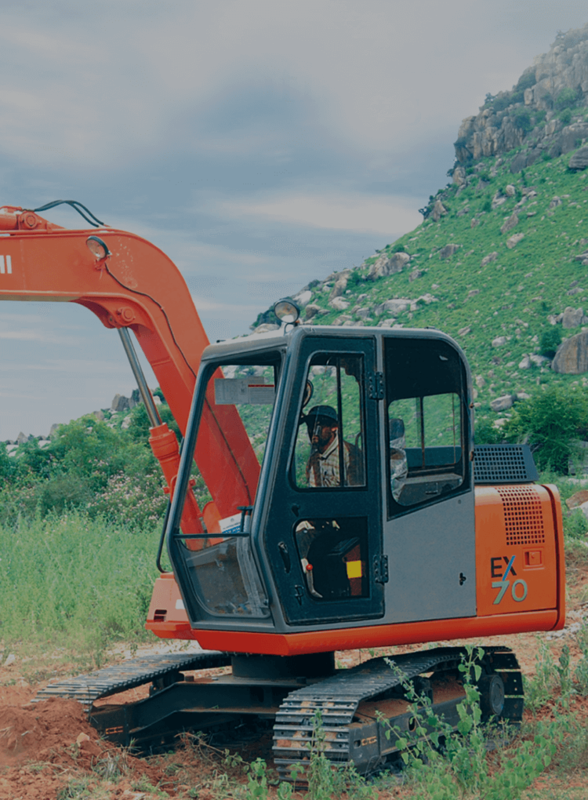 As a result, Sushee Infra is able to remain focused on excavation targets while Tata Hitachi’s team of engineers ensures maximum machine availability. ConSite is an automated data report service specifically designed for Hitachi construction machines with satellite system access. It leverages operational data relayed through the satellite to create an individual machine monthly report, which is sent to the customer and the dealer along with alarm notifications. The alarm notifications are sent as they occur so that customers can identify operational issues with their machines in a timely manner. The partnership between Tata Hitachi and Sushee Infra & Mining Limited has stood the test of the time. Over the years, both the companies have partnered successfully on various key projects pertaining to mining and infrastructure. The association between the two industry leaders was further strengthened when work at the coal mines of Sathupalli was awarded to Sushee Infra. The varying conditions, tight project schedules and reducing margins made this project an engineering challenge. However, the heavier, stronger and faster ZAXIS470H GI series hydraulic excavators from the diversified product portfolio of Tata Hitachi ensured increased productivity and profitability. Accompanied by Tata Hitachi’s exceptional after-sales service, project performance surpassed the expectations of Sushee Infra at every level. ZAXIS470H hydraulic excavator has helped Sushee Infra address all the challenges to remain profitable. Cost savings. HIOS-III (Human Intelligence Operating System) hydraulic system and two power modes integral to ZAXIS470H result in higher fuel economy which has translated into significant cost savings for Sushee Infra. High production. Powerful 315 HP engine has made high production in stipulated time possible. Low maintenance and easy serviceability. Long oil and filter change intervals result in reduced maintenance costs. Whereas dedicated inspection points ensure easy serviceability. High machine availability. Industry-first Full Maintenance Contract (FMC) that goes beyond 25000 Hrs of machine operation ensures machines are always available. Full technical support. Dedicated onsite parts inventory and service team ensures that the machines are never down and always available for production. Remote monitoring Global e-Service and ConSite (IT interface) help in better machine utilization and maintenance through remote performance monitoring. The success of the mutually beneficial relationship is evident from the fact that Sushee Infra already has a fleet of more than 100 Tata Hitachi machines working across multiple locations in India. Hitachi believes in delivering innovations that answer society’s challenges and make significant contributions toward the society as a whole. On similar lines, Sushee Infra envisions transforming the energy sector in India and contribute toward its vision of nation building. It is this zeal to transform lives which possibly has brought the two industry leaders together and both have been able to repeat the success story project after project. Tata Hitachi looks forward to strengthening this relationship further by offering Sushee Infra the latest in technology and the best of its equipment and service support.